Patios, Decks, Rooftops and Gardens for Al Fresco Dining. I know a lot of Utahns who like to say that they came here for the winters but stayed for the summers. I'm one of them. I moved here during a February snowstorm and immediately fell in love with the incredible powder skiing, but later came to enjoy the glorious summers in the Beehive State just as much. 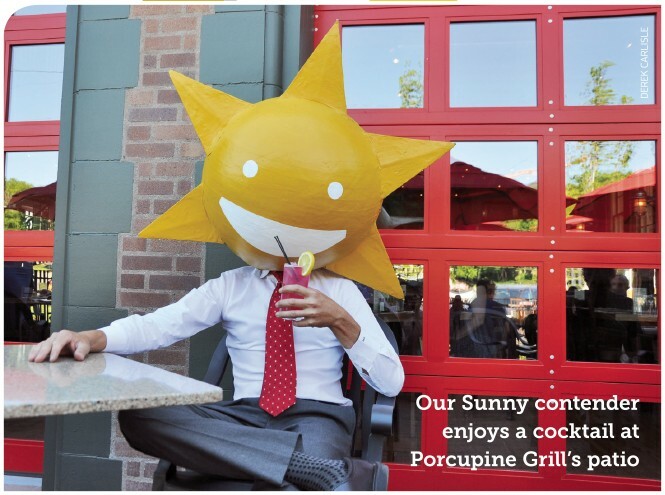 The bountiful sun of Utah summers, combined with a mostly dry climate, makes this an ideal place to enjoy dining al fresco on our seemingly endless restaurant patios, decks, gardens, courtyards, rooftops and such. You're probably already well-acquainted with some of our most coveted outdoor dining destinations like La Caille, Trio, Ruth's Diner, Tuscany, Log Haven and Oasis Cafe. Here are some excellent al fresco eating spots that might be a little less familiar. To someone walking past downtown's Green Pig Pub & Grill (31 E. 400 South, 801-532-7441, TheGreenPigPub.com), it might look like the last place you'd expect to bask in the sun. But, look up. When you do, chances are you'll find the pub's rooftop patio bustling with frolicking customers enjoying carne asada tacos, Cuban sandwiches, fish and chips or maybe the Kobe corned beef Reuben, along with libations served up by some of the best and friendliest bartenders in town. Similarly, if rooftop dining and imbibing is your thing, you'd be hard-pressed to find a more popular spot than Gracie's (326 S. West Temple, 801-819-7565, GraciesSLC.com), an urban gastropub where the food and drink hit the same high notes that the rooftop patio does. Snack on poutine or pumpkin crab cakes before getting yourself outside of the marvelous pulled pork belly sandwich. In addition to killer cocktails like the mango mojito, Gracie's also has an excellent wine and beer selection. Eva (317 S. Main, 801-359-8447, EvaSLC.com) is another downtown eatery—one specializing in tapas/small plates—that from the outside wouldn't be an obvious choice for al fresco dining. But, tucked away behind the restaurant is a quiet little outdoor oasis which is perfect for enjoying a nosh in warm weather. Delicious, eclectic dishes such as lamb kibbeh, whole charred cauliflower with romesco sauce and guajillo-braised pork ribs will have you singing in the sunshine. A fun summer getaway would be to jump on the UTA Frontrunner and take it to Daybreak, where Porch restaurant (11274 Kestrel Rise Road, South Jordan, 801-679-1066, PorchUtah.com) is located. Walk from the train to SoDa Row and grab a sidewalk seat near one of the patio's flower baskets. Porch is the creation of Jen Gilroy, who also owns SLC's Meditrina and knows a thing or two about Southern-style hospitality. Settle in with a Red Beet and Pink Peppercorn Shrub cocktail—remember, you're riding the train, so bottoms up—and nibble on iron skillet cornbread before indulging in Southern "brick" chicken with macaroni and cheese or homemade meatloaf. The comfort food here is definitely "down home," but the ambiance is trendy and upscale. So, take a break in Daybreak. In Park City, Grappa's (151 Main, 435-645-0636, GrappaRestaurant.com) terraced gardens and multi-level outdoor seating is the place to be in summer. Who could resist the lobster ravioli starter, with oyster mushrooms, fresh chervil and lobster cream whether dining inside or out? And, the pan-seared whole branzino is remarkable, as is Grappa's classic slow-braised veal osso bucco. Don't forget to toast to the summer with an after-dinner splash of grappa, of course. If it's vast views of the horizon you're hankering for, head down to Draper to the Cliff House (12234 Draper Gate Drive, 801-617-8600, CliffHouseGP.com), where the elevated terrace provides customers the opportunity to see for miles and miles. Grab a seat near the gastropub's fire pit in case it gets cool in the evening, and enjoy people-watching; the deck is usually packed with partiers. There's something for everybody on the wide-ranging menu, which covers the bases—from typical pub fare like artisanal pizzas, burgers and sandwiches—to tonkotsu ramen, short rib pappardelle Bolognese and even sushi. The Sunday brunch shrimp and grits are an especially good way to prepare for the week to come. Dining on the courtyard patio at Café Madrid (5244 S. Highland Drive, Holladay, 801-273-0837, CafeMadrid.net) is like a summer getaway to España. You'll feel as though you've dropped into a Spanish finca, especially when you taste the bacon-rolled shrimp tapa. Enjoy a carafe of cooling housemade sangría as you tuck into a classic Spanish dish like fideuà—thin vermicelli-style noodles with shrimp, calamari, clams and mussels in a saffron sauce. If you're looking to avoid the crowds in downtown Sugar House, consider the patio dining at The Dodo (1355 E. 2100 South, 801-486-2473, TheDodoRestaurant.com). Despite having relocated a couple of times, Dodo dining has been a Salt Lake City staple for more than 30 years. Overlooking Sugar House Park, al fresco eating here offers great views while you enjoy classic Dodo dishes such as their honey-baked salmon filet, Cajun chicken Alfredo, beef Stroganoff and, of course, the ever-popular artichoke pie. Views of the city are unparalleled on the shaded patio at Em's restaurant (271 N. Center St., 801-596-0566, EmsRestaurant.com), which feels like an escape from the very city you're seeing. Emily Gassmann's namesake eatery has always reminded me more of Portland or Berkeley than the Beehive, especially when I indulge in her famous goat cheese-stuffed tamales with chipotle crema. And, the artichoke, spinach, Havarti cheese and caramelized onion frittata at brunch is simply irresistible—especially on the patio. So there you have it. Hang up the apron, ditch the drive-thru and bask in some of the best outdoor culinary spots SLC has to offer.